Growing up as an agnostic, John did not give religious matters too much thought. Nor did he assess his actions against any kind of religious teachings or moral codes. If something seemed advantageous in the moment and the risk was not too great, it was worthwhile. This encompassed all sorts of unethical activities that became a part of his day-to-day activities. It is not that John was a bad man—he had no desire to hurt anyone—but he really couldn’t see the connection between his actions and the effect they had on others. He lacked awareness and responsibility. Then John found religion. Actually, he found Scientology and at first resented that it was a religion. It was only after a significant study of the subject and a number of improvements in his personal life that he truly understood what a religion was and how important it had become to him. Like any religion, Scientology provided him with answers to questions like “Why are we here?” “How did we get here?” “What is right and wrong?” He found out that acts have consequences far into the future. It came as somewhat of a revelation that he personally had a hand in creating that future and that it didn’t all “just happen.” With this came a higher level of personal responsibility for his actions. If someone fails at or breaks faith with some cause, group or idea they have identified with, it can lead to an uncomfortable loss of self-respect. At length, John discovered that he now had a framework within which to align his thoughts and come to rational decisions. He had not known that he lacked this nor was he looking for such. But now that he had it, he could not imagine operating in life without it. John had acquired a moral compass. Religion had profoundly and positively influenced his view of things. His life had greatly changed for the better and he attributed this to Scientology. Thus, it struck him as unfair, discriminatory and just plain wrong that he sometimes ran into people who, knowing almost nothing about it, would attack and defame his chosen belief system. He also could not understand those few who had actually been introduced to Scientology and had participated in it for some time before departing and attacking it. This was a mystery to him until he discovered that the cause lay in a basic aspect of human nature. If someone fails at or breaks faith with some cause, group or idea they have identified with, it can lead to an uncomfortable loss of self-respect. To combat this, that person may seek to justify why they took (or failed to take) certain actions by denigrating or criticizing the target of those actions. If someone, having studied the tenets of Scientology, then violates its basic precepts of morality, he often feels compelled to attack it in order to make his own violations seem less wrong. A current example would be Leah Remini. The more she attacks Scientology, the more she feels compelled to further attack it to justify her previous offenses. Religion does indeed influence one’s view of things. One can learn from its lessons and go on to a more productive and positive life. Conversely, one can also fail to make the grade and then seek to justify one’s failure by attacking religion. That doesn’t mean that person is past redemption, it just means that their road will be longer and harder to walk. We, after all is said and done, are all spiritual beings and there is hope for all of us. Religion is the path one takes to arrive at a higher level. 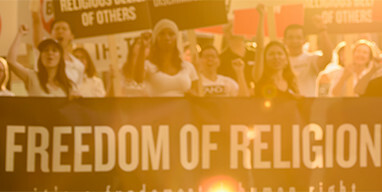 Religious freedom is the right to choose what path we will take. And religious bigotry is merely an attempt—by those who have already failed—to prevent others from ascending to a higher plane.